Try and see this extraordinary collection of art works by Vladimir Yankilevsky before it closes on Sunday, March 7, says Corinna Lotz. Vladimir Yankilevsky's haunting show is the opening skirmish in a Russian invasion that is bound to shock and awe London this spring. Over 500 art lovers – Russians, Londoners and visitors from around the world – crowded into the Mall Galleries on the opening night to celebrate the work of a non-conformist rebel from the Soviet era. Not only is this the artist’s only solo show in the UK, but it is the first time that his work has been seen here for over 30 years. The only other occasion was in 1977, when the Institute of Contemporary Art, next door to the Mall Galleries, staged a group exhibition called Unofficial Art from the Soviet Union. Gallerists Iana Kobeleva and Anna Chalova have felt for a few years there was a niche in the London art scene for the largely unseen work by artists officially denounced as degenerate during the Khrushchev and Brezhnev eras. Many left the Soviet Union to live abroad as a result. Their conviction that London would be a place that Yankilevsky’s and other former Soviet artists work would find an appreciative audience has been more than confirmed by the passionate reception for Yankilevsky’s no-holds-barred evocation of life in oppressive times. 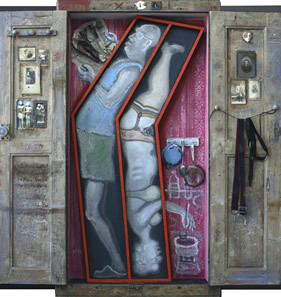 Yankilevsky’s surreal, often harsh, sexually-explicit drawings, oils, assemblages and mixed media works are not only relevant to the political repression of the late Stalinist period. Their highly-charged resonances, the feelings of disconnection and frustration in his Mutants and Megalopolis series relates to experiences of life in a secretive, Big Brother state in any society. Like the other “non-conformists”, Yankilevsky was denounced as “degenerate” by Soviet premier Nikita Khrushchev in 1962. It took 14 years for the Soviet public to see his 1964 painting dedicated to Dmitri Shostakovich, even though he was being shown in Czechoslovakia and Poland. A semi-clandestine visit by Greek collector George Costakis in the same year is documented in photographs at the Mall Galleries. In 1965, a solo exhibition of his work at the Biophysics Institute at the Academy of Sciences of the USSR was closed down. Yankilevsky spent years as an outsider. In the years of perestroika and glasnost, he acquired a New York studio, but eventually settled in Paris. Perhaps the most iconic work is Triptych No.4: Being in the Universe (Dedicated to Dmitri Shostakovich) from 1964. It is one of his series of monumental multi-part constructions which stretch from the early 1960s into the 21st century. Denied artists’ materials by exclusion, Yankilevsky scoured the streets at night for scrap materials to incorporate into his work. Battered wooden doors, clothes, wallpaper, newspapers, kitchen utensils and other objects make up these huge collages, in a way akin to Robert Rauschenberg’s “combines” and assemblages by Edward Kienholz, whose tragic depiction of Amsterdam’s red light district was recently on view at the National Gallery. The alienation of people living in a metropolis, crowded into claustrophobic spaces, the tensions between the sexes, travelling through time and space – Yankilevsky articulates these and much else besides. His work is highly stylised into symbolic hieratic formats, while a ferocious energy bursts through. 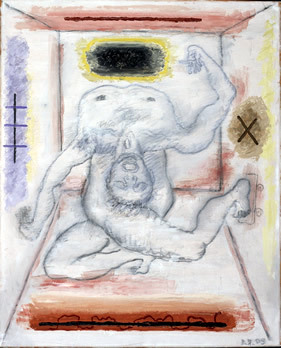 An end-of-the-world mood and gallows humour often prevail in his frenzied drawings. Composers including Bach, Schnittke and Shostakovich are amongst his most important influences as his works range from the unbearably brutal to the elegiac in mood. Some of Yankilevsky’s ultra psychological and often disturbing mixed-media 3D constructions will re-emerge when the new Aktis Gallery, run by Kobeleva and Chalova, opens. But many of the works will have to return to museums and private collections. The Aktis gallery, which will open its doors in Mayfair towards the end of March, will specialise in 20th century Russian artists who have worked outside Russia. Kobeleva feels that this will give a new and deeper insight into a hitherto largely hidden history. Vladimir Yankilevsky’s Anatomy of Feelings is at the Mall Galleries, The Mall, SW1 until Sunday March 7. Open daily 10am-5pm Admission free.